Virgin Australia vaulted back to the top of the table for domestic on-time performance in June while Tigerair Australia posted a big lift in punctuality, new figures show. The Bureau of Infrastructure, Transport and Regional Economics (BITRE) report showed 92.1 per cent of Virgin’s flights arrived on time in the month, while 93.2 per cent of its services pushed back from the departure gate on time. Rival Qantas, which led the punctuality rankings in May, dropped back to second in June with a 90.7 per cent on time arrival rate and 91.4 per cent on time departure rate despite also lifting its performance in the month. Qantas and Virgin have been battling for on-time honours in recent times given the importance placed on punctuality for all travellers and especially the lucrative corporate and government travel market. The two have swapped the lead on several occasions in recent times. The BITRE report defines a flight as on-time if it leaves or arrives within 15 minutes of the published schedule. 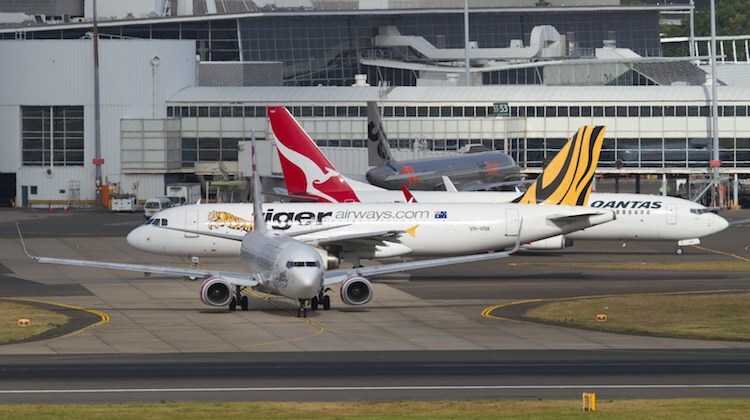 Meanwhile, Tigerair was the biggest improver in June, with its on time departure performance improving 4.9 percentage points to 89.5 per cent, while the Virgin-owned low-cost carrier lifted its on time arrivals 5.5 percentage points to 87.5 per cent. It was the third-best performance for any airline in the month. Among the regional carriers, Regional Express (Rex) had the best departure performance with 88.1 per cent of flights on time while QantasLink achieved the highest rate of on time arrivals at 86.1 per cent. The BITRE report said it was a good month for all domestic travellers, with the on-time performance in June above the long-term average for both arrivals and departures. And two routes had perfect records in the month, with 100 per cent of Melbourne-Hamilton Island departures taking off on time and all Canberra-Adelaide arrivals reaching the gate within 15 minutes of schedule. Travellers between Canberra and Sydney suffered the highest percentage of cancellations in June, with 5.1 per cent of Canberra-Sydney flights cancelled, while the cancellation rate in the reverse direction was 4.6 per cent. The reality is these figures mean nothing when comparing airlines. To truly appreciate the figures you need to compare fleet size and number of sectors a day to get an overall appreciation of performance. While the BITRE figures may play into the publicity/advertising game, they don’t give the full picture. Nice headline but no substance. Question to anyone who can answer it. Who does an airline have the right/option to cancel a flight due to lack of passengers? If the airline has offered a flight and passengers have paid for it doesn’t the airline have a legal liability to fly no matter how many passengers are on board? I bet July won’t look as pretty! You need to read the terms and conditions of the ticket (not the fare class), there would be something in there. Airlines do not cancel flights on the day because the load factor is poor. This is done days or weeks prior when their commercial divisions are putting the numbers together. If your flight is cancelled on the day it is purely due to operational reasons, e.g, your SYD BNE aircraft may not be broken but a SYDMEL aircraft is. Depending on the load factor and recovery of the customers on both flights the SYDMEL flight may swap onto the aircraft originally intended for SYDBNE if they are able to recovery all the customers say within two hours, as opposed to perhaps a 24 hour for SYDMEL. Further to Coreys post, Check the T&Cs, they pretty much are selling transportation between an origin and destination, not the time or even the day for that matter. One Star the worst performer.